The classic Dickens tale weaves a literary tapestry of love, duty and morality caressed by a long time mystery: who is Pip’s benefactor? The boy grows and learns, loves and leaves, all the while he discovers, sometimes painfully, how his decisions impact his young life and those around him. This is the story of growing up. 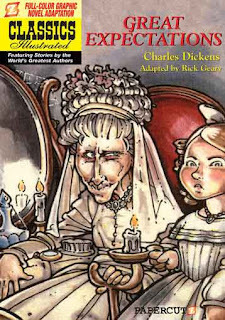 I first read an abridged version of Dickens’ yarn in grade school and the story presented here is much like the first one I read. What I remember best is the mystery and cruelty – it is, after all, a tale of a boy growing up. Mostly, I remember the nasty and hateful Miss Havisham, and her dirty little taunting of both Pip and the spiteful girl he loves. In those days I just knew that the mysterious benefactor was Miss Havisham. I would have bet on it. This go around I knew better. Good stories are not so easy to figure out. What I missed the first time was Pip’s neglect of Joe. Teenagers never appreciate what they have until they have children of their own. This time I felt Joe’s pain, but was refreshed in his pastoral and unconditional love for Pip. It took some time for me to adjust to the art, as the style is different than modern comics; however, I came to appreciate the charm of the art and the affectionate connection between it and the story. I found myself smiling as I read this adaptation, breathing in the time Dickens takes to weave his stories. This classic tale is appropriate for any children, but the reading level is most appropriate starting in upper elementary. This is an abridged version perfect for young readers who are ready to taste traditional literature but who are not mature enough for the daunting pages of the unabridged prose. Consider this a stepping-stone to traditional literature, a bridge to help students learn to accept traditional literature as important and interesting. The Classics Illustrated series is an excellent introduction to traditional literature. You should definitely check out Geary's version of The Invisible Man. My girls enjoyed that more than Great Expectations - the story is a bit more accessible and it's a great adaptation. It is a bit violent, in keeping with the original, so maybe it's best for upper grades. Funny you mention that, Tracy. We have The Invisible Man on our queue. I haven't read it yet.